Sidamo – Coffee from the southern region of Ethiopia, and according to some the very spot where coffee was discovered. Sidamo coffee beans look a bit unusual, with a whiteish line going through the middle of the bean even after being roasted. 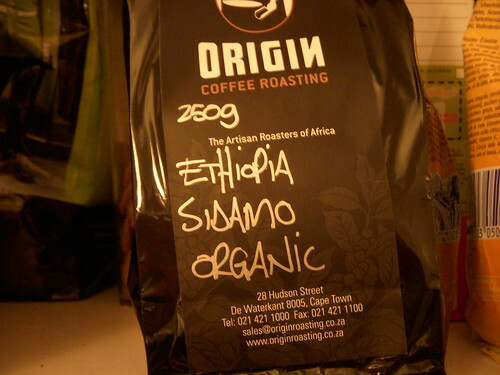 I got my latest bag of freshly roasted organic Sidamo coffee beans from my favourite coffee shop, Origin Coffee Roasting in Cape Town, almost 10,000 miles away, during my last trip down to South Africa. The way it was roasted and eventually prepared by me for my daily morning dose of Cappuccino reminded my lips and taste buds of caramel/chocolately overtones. That’s my impression and “true to the bone” (slang: for gut feel) feeling, however, I am aware that some experts and websites classify Sidamo as a coffee with a floral essence – who am I to argue ? However, lots of things come into play here just to make our lives more complicated – the type of milk, the water, the type of roast (Origin Coffee don’t dark roast their Sidamo beans until the oils begin to settle on the bean), plus when milk is frothed it becomes sweet and caramelly like. Enough ramblings and justification for my tongue. Anyway, it’s all over now as I just finished the 250g bag in under 2 weeks of course, but don’t know where and when I’ll get another lovely bag of organic Sidamo beans – Oh ! Sidamo, Oh ! Sidamo……… As you can guess, Sidamo comes highly recommended by moi. Look out for it in gourmet coffee shops. As with the majority of African Coffees (yes ! Ethiopia is in Africa for those who skipped geography lessons), which tend to be bold and “strong”, you will get a good taste using a French Press or Cafetiere. Enjoy ! This entry was posted on Friday, November 23rd, 2007 at 3:11 pm	and posted in Bean Talk - Coffees. You can follow any responses to this entry through the RSS 2.0 feed.